Last week Queen Letizia surprised many royal watchers by wearing a new tiara, reportedly a years-old gift from King Felipe. Her Majesty wore the tiara for the first time for Danish Queen Margrethe’s 75th birthday celebrations. The new tiara, by Spanish jeweler Ansorena, is made of diamonds and pearls, and includes a Fleur-de-lis, a symbol of the House of Bourbon. Many of the jewels associated with Spain’s Royal Family have been sold or lost over the years, amid war and political turmoil. Still, beyond a crown and scepter used to symbolize the monarchy, some tiaras have remained. Plus, Queen Sofia incorporated some more from her families. 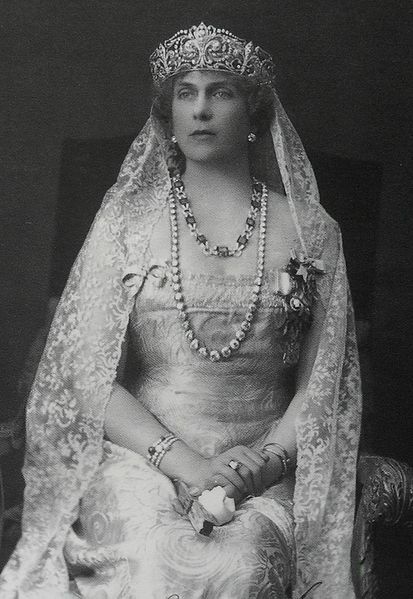 A bigger Fleur-delis tiara also from Ansorena was a gift from King Alfonso XIII to Queen Victoria Eugenia in the early 1900’s. Both Queen Sofia and Queen Letizia have often worn a floral tiara that belonged to the Royal Family but left the family, according to reports. Former Spanish dictator Franco bought it for Queen Sofia’s wedding to King Juan Carlos.